Q: Well Kimi, first of all the crowd is really showing their pleasure to have you back in Grand Prix racing. You’re flirting with the victory, now you are quite often on the podium, you did an incredible battle for third place. We had feeling that maybe you had difficulty with your car, maybe sometimes, but the result is that you are finishing third. It’s a pure joy for us and we like to congratulate you for this great position. 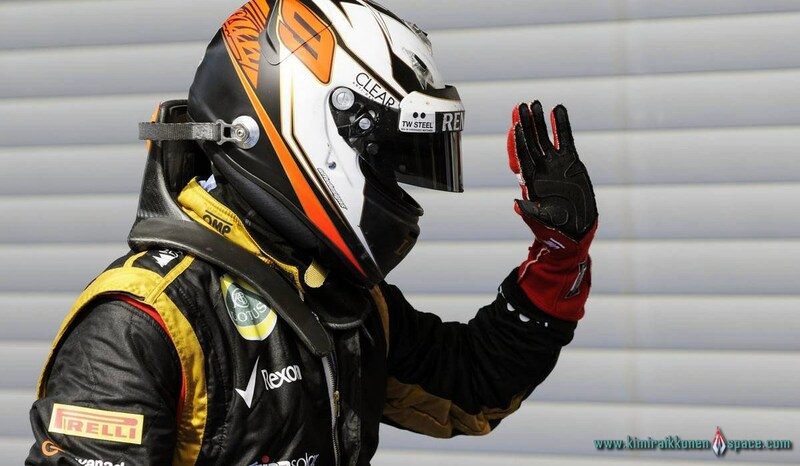 Kimi Raikkonen: Thanks a lot and I mean it’s nice to be back here. Always lots of fans and good racing. So I think we have seen very nice racing today. Of course not the easiest day for me and for the team but the car was not exactly like we are liking but I was fighting and try to get the best out of it and we managed to get some good points for myself and for the team, so that’s the main thing but for sure not the easiest race, one of the most difficult but that’s how it goes and we try next week better. Q: Kimi, two defining moments that we can remember from that race from you, particularly the start, tell us about that. KR: I had an OK start, I gained one place on Sauber and I think a very similar start to Jenson and I just saw it in the mirrors that there’s some accidents going to happen so I was pretty lucky to get out of it. I think they just missed me on the rear. But the Williams tried to get me – but he had a jump start, I could see it already, before the lights went that somebody was moving a lot so for me it was no problem. KR: Yeah, my car wasn’t very nice to drive the whole race, even yesterday with new tyres in qualifying it was OK but even third or fourth we were quite far away from the guys in front of us – so I wasn’t expecting a very easy ride and it turned out to be very difficult. Not grip, the first few laps with new tyres were always good but then sliding: no front end, no rear end, just struggling with the grip and last we had to run a bit more downforce to get grip and we were really slow in a straight line, so with Michael I passed him once, he got me back and I knew my only chance was try to get the DRS and then to be ahead of him because even if I had the DRS I could not pass him on the straight with the limiter. So, I had to just take a chance to overtake him with the KERS into Eau Rouge And it kind of paid off – but he almost got me still back which shows us that we didn’t really have the speed today – but we had a third place so it’s OK. Not the easiest race but pretty OK.
Q: (Oana Popoiu – F1Zone.net) Kimi, for the first time you failed to win a Belgian race that you have finished. How does that feel and do you think that double DRS would have helped you to gain a better position today? KR: Well, we couldn’t use it because Friday was such bad weather, but it’s better third than not to finish, so OK, we didn’t win but we didn’t have the speed today so we didn’t deserve to win either. In the last three races we had the speed in races where you cannot overtake and here we just didn’t have the speed. I will take third place, I’m pretty happy to finish on the podium given how difficult the car was handling and how tricky it was throughout the whole race. Q: (Heikki Kulta – Turun Sanomat) Kimi, the lack of power here, does it worry you just before going to Monza where you need even more power? KR: I don’t know if we were lacking any power. That’s what people always say but we don’t know what we have. We just didn’t have the speed today and hopefully with a bit more warm weather and layout of the circuit might make a difference. I don’t expect just to be suddenly in the front, be up there easily but we’ve been up there more or less at every circuit and giving ourselves a good chance and this was one of the most difficult races, for sure. Hopefully it will go back to what it’s been in previous races for Monza. We’ll just have to wait and see. Q: (Paolo Ianieri – La Gazzetta dello Sport) To all three of you, looking at the start with Grosjean who caused another accident, it’s not the first time that that has happened this year. Are you going to talk to him also or are you expecting the stewards to be harsh on him for the next race? JB: I will leave this one for Kimi. I didn’t see it. KR: I don’t want to talk about it because I didn’t see the whole thing. Somebody can say it’s this one guy’s fault and another guy may have a different opinion. Until I see the whole thing I have nothing to say. It’s not our work or job to tell somebody what to do and what not to do. That’s why we have stewards. We will see what happens. Great drive, Kimi, and even though it would have been nicer to have seen you win here yet again, I could see that the car was difficult at times. Lots of correcting and steering movement seen from the on board cam. Still, a podium finish is never the easiest thing to do and you got there because of your incredible effort!! Thanks for returning to F1 and good luck in Monza! Thanks again Evenstar for everything you’ve done. You are so hard working and dedicated. Those race galleries are amazing, keeps blowing my mind everytime. Take care and keep up the excellent job!